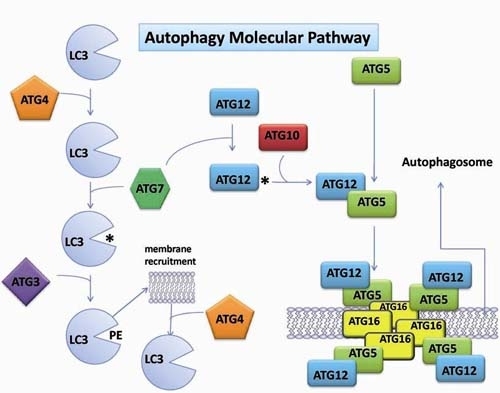 Autophagy is a highly conserved cellular degradation process. In this degradation pathway in mammalian cells constituents of cytosol and organelles are sequestered into a double-membrane vesicle and delivered into the lysosome. This results in breakdown and eventual recycling of the resulting macromolecules. 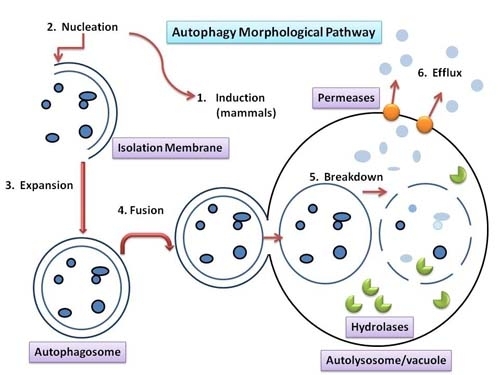 In eukaryotic cells autophagy is divided into three major mechanistically different pathways: Macroautophagy is a catabolic process involving dynamic membrane rearrangement. Cytoplasmic components are sequestered into atuophagosomes. These are double-membrane vesicles which fuse with lysosomes in mammalian cells resulting in degradation. Microautophagy is a mechanism for the uptake of cytosolic components into the lysosome by invagination, protrusion and septation of the lysosome membrane. These components will be degraded by lysosomal enzymes. Chaperone-mediated autophagy (CMA) allows selective degradation of soluble proteins in lysosomes. In contrast to the other mammalian forms of autophagy, vesicle formation or major changes in the lysosomal membrane are not required. The target proteins are recognized at their KFERQ-like motif by a chaperone complex. They directly cross the lysosomal membrane to reach the lumen, where they are rapidly degraded. Beclin-1 is found to play an important role in autophagy initiation and autophagosome clearance. It is a coiled-coil Bcl-2-interacting protein which is homologous to the yeast autophagy gene APG6. This mammalian autophagy gene can inhibit tumorigenesis and is expressed at reduced levels in human breast carcinoma. This suggests that defects in autophagy proteins may contribute to the development or progression of tumors. Beclin-1 initiates autophagy by the formation of a complex with phosphoinositide-3-kinase, class 3 (PIK3C3). A protein called UVRAG (UV radiation resistance associated gene) activates the beclin-1 PIK3C3 complex. In addition, beclin-1 levels have been shown to play an imortant role on Alzheimer disease pathology shown with transgenic mice. PIST or GOPC (Golgi-associated PDZ and coiled-coil motif-containing protein) is described as a protein binding partner to beclin-1, which can synergize to induce autophagy. Microtubule-associated protein 1 light chain 3 (LC3), a homolog of yeast APG8, is most abundant in autophagosomal membranes and well established as a marker for autophagosome and autophagic activity. 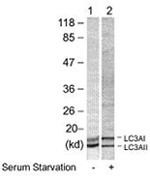 The polyubiquitin-binding protein p62/SQSTM1 is an alternative marker to LC3 for autophagy which is described to bind directly to ATG8/LC3. Autophagy-related genes: The identification of the ATG genes in yeast and the finding of orthologs in other organisms, reveals the conservation of the machinery in all eukaryotes. APG7 is essential for autophagy conjugation systems, autophagosome formation, starvation-induced bulk degradation of proteins and organelles. It has been suggested that it is essential for multisubstrates such as ATG8-like proteins and ATG12. ATG7, a member of the autophagy family of proteins, is the human gene product similar in homology to yeast APG7. In yeast the protein shows homology to the ATP-binding and catalytic sites of the E1 ubiquitin-activating enzymes. ATG12 forms a conjugate with ATG5. This conjugate has a ubiquitin-protein ligase (E3)-like activity for protein lipidation in autophagy. ATG12 has also been shown to interact with ATG10 in human embryonic kidney cells in the presence of ATG7. At least two isoforms of ATG12 are known to exist. Lysosomal-associated membrane proteins 1 and 2 (Lamp1/2) are two of the most abundant lysosomal components which have found to be involved in autophagy. Jaeger AJ et al: Regulation of amyloid precursor protein processing by the Beclin 1 complex. Kametaka S et al: Apg14p and Apg6/Vps30p form a protein complex essential for autophagy in the yeast, Saccharomyces cerevisiae. Liang XH et al: Protection against fatal Sindbis virus encephalitis by beclin, a novel Bcl-2-interacting protein. Liang, XH et al: Induction of autophagy and inhibition of tumorigenesis by beclin 1. Massey, AC et al: Chaperone-mediated autophagy in aging and disease. Pankiv, S et al: p62/SQSTM1 binds directly to Atg8/LC3 to facilitate degradation of ubiquitinated protein aggregates by autophagy. Pickford, F et al: The autophagy-related protein beclin 1 shows reduced expression in early Alzheimer disease and regulates amyloid beta accumulation in mice. Yue Z et al: A novel protein complex linking the delta 2 glutamate receptor and autophagy: implications for neurodegeneration in lurcher mice. Yang, Z et al: An overview of the molecular mechanism of autophagy.